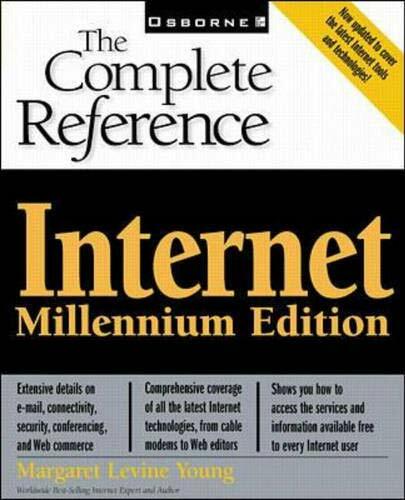 [PDF] Internet: The Complete Reference, Millennium Edition | Free eBooks Download - EBOOKEE! Description: Master the Internet Universe. Prepare yourself for the Internet millennium with Internet: The Complete Reference, Millennium Edition, by Margaret Levine Young. This netizen's bible puts you in charge of everything the Internet has to offer from basic e-mail to hyper-secure Web commerce. It shows you how to get the most out of Netscape Navigator and Internet Explorer create advanced Web pages with graphics transfer files take advantage of voice and video conferencing even register your own domain name. Keep this unmatched resource at your keyboard to: Become an instant expert on Microsoft FrontPage, e-commerce, push technology, and real-time audio and video streaming Connect to the Internet using such high-speed technologies as cable modems, ISDN, and ADSL Quickly and safely download and install software from the Web Increase your Web enjoyment and profit with chat sessions, conferences, subscriptions, and newsgroups And much, much more. No comments for "[PDF] Internet: The Complete Reference, Millennium Edition".